..the Fed does not engage in reflective equilibrium. It rejects the conclusions of what I regard as the standard Patinkin-style existing model of Krugman (1999). But it does not propose an alternative model. There seems to me to be no theoretical ground, no model even considered as a filing system, underpinning the "orthodox" modes of thought that the Fed believes. And it does not seem to feel this absence aaa a problem. I find that somewhat disturbing. It's unfortunate that Brad's post distracted me, as I was busily engaged in reflective equilibrum, but what the heck. I thought I would check out Krugman's 1999 article, to refresh my memory. As I thought, the meat of the thing isn't actually a "Patinkin" model, it's a simple Lucas cash-in-advance model. As far as I remember, this thing has not been rejected where I work, though some of my colleagues might object to the CIA constraint as being insufficiently grounded in theory. Further, out here in flyover country (or the pond, as it's come to be known in recent days), we take offense when people call our models "orthodox," and if someone suggested we think of our theories as "filing systems," we would likely scream and run away. Oh, by the way, here's something interesting. Let's take Brad seriously and look at the implications of Krugman's (1999) model. There's a representative, infinitely lived agent, with discount factor B and utility function u(c), where c is current consumption. There is a fixed endowment of perishable consumption goods each period, which must be purchased with money, which is supplied by the central bank. We can flesh out the details of transactions, for example there can be many households which sell their endowment and purchase output each period, or output could be grown on "Lucas fruit trees," with consumers owning shares in the trees. But those are details that are irrelevant for the equilibrium. As well, money could be injected by way of lump-sum transfers, or through open market operations. Again, the details don't matter for what we'll do here. Let R(t) denote the nominal interest rate, i(t) the inflation rate, and M(t) the aggregate money stock. (3) m(t+1) = B - 1 + BR(t). 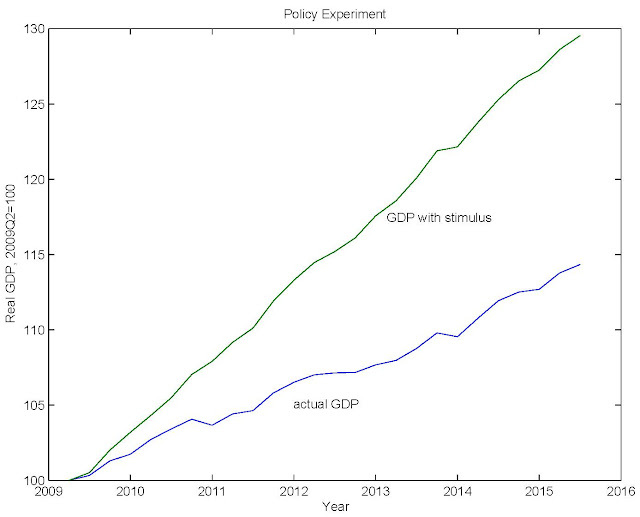 Basically, Krugman's model is a purely Fisherian model of inflation - there's no liquidity effect, only a Fisher effect, so the nominal interest rate always reflects only anticipated inflation. So if the central bank thinks inflation is too low and wants it to go up, what should it do? Equation (1) says it must raise the nominal interest rate. So, I'm pleased to report that Brad is a neo-Fisherian. Seemingly, so is Paul. Tim Taylor has written a blog post about a talk by Larry Summers on secular stagnation. Taylor doesn't seem to quibble with Summers's interpretation of what is going on in the data, but he thinks that we should view secular stagnation as a long-run problem, with potential long run solutions. This appears to have put Paul Krugman in a bad mood which in turn ruined Taylor's day. ...it seems to me that we are in a situation where monetary and fiscal stimulus that has been extremely high by historical standards since about 2008 has had a much smaller effect on output and inflation than would have been expected before the Great Recession. 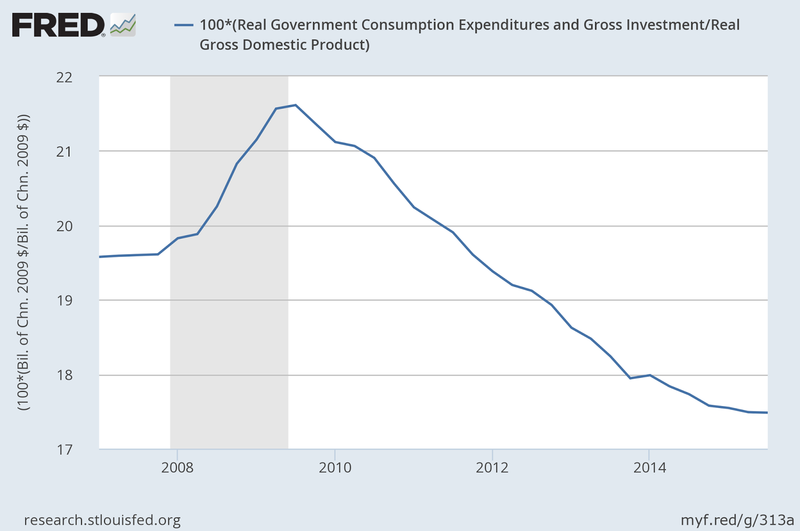 So, government spending has been falling for most of the period since the end of the recession, and government spending accounts for about two percentage points less, as a fraction of GDP, than before the recession. That hardly looks like a stimulus program. ...if you have a persistent problem of inadequate demand — which is the secular stagnation argument — then find things that will boost demand. 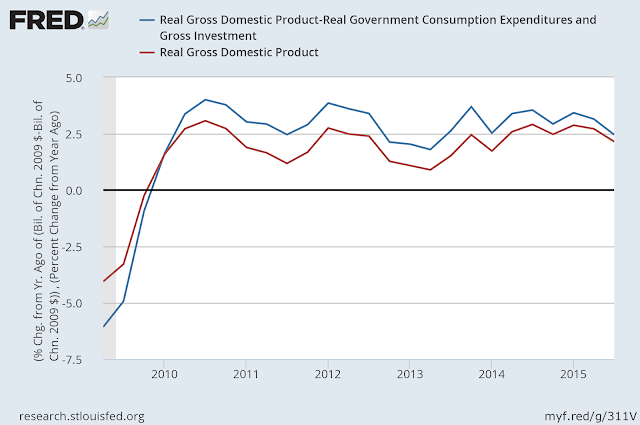 So, Krugman is making the case that we have a problem of "inadequate demand" that has persisted since the beginning of the Great Recession, and that fiscal multipliers are large - "well above one." 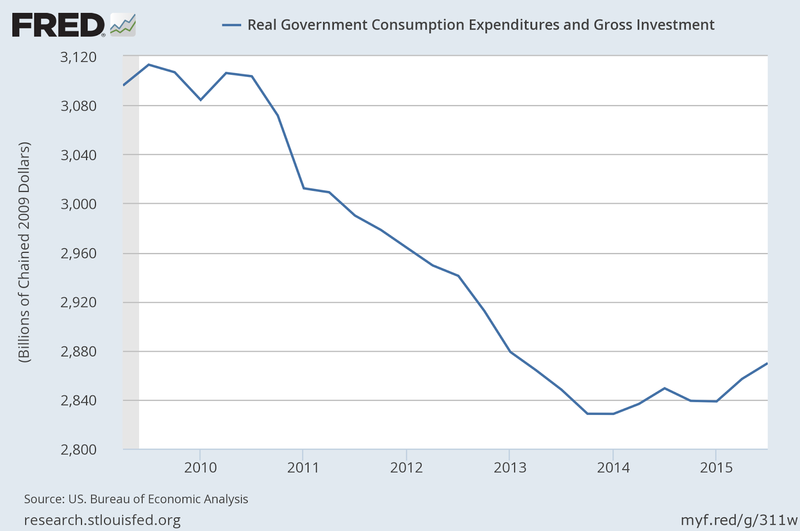 First, suppose we look at the behavior of real GDP and of real GDP minus government expenditures - the latter reflecting what Krugman would consider private demand, I think. The recovery from the last recession has indeed been sluggish, with average real GDP growth of 2.2% since the end of the recession. 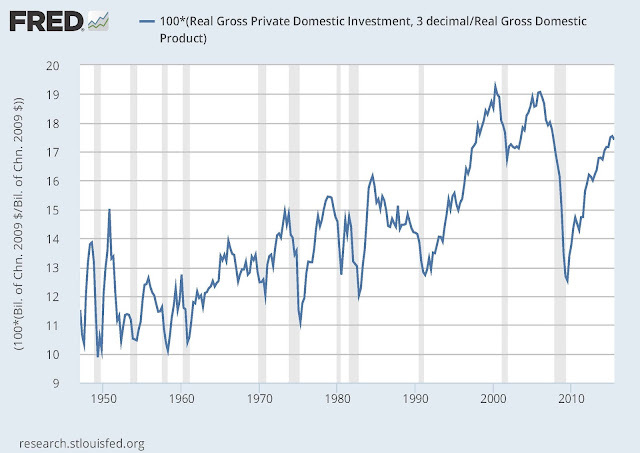 But private demand growth is certainly less sluggish, with average growth of 3.0%. That's not as strong as growth coming out of the 1981-82 recession, for example. 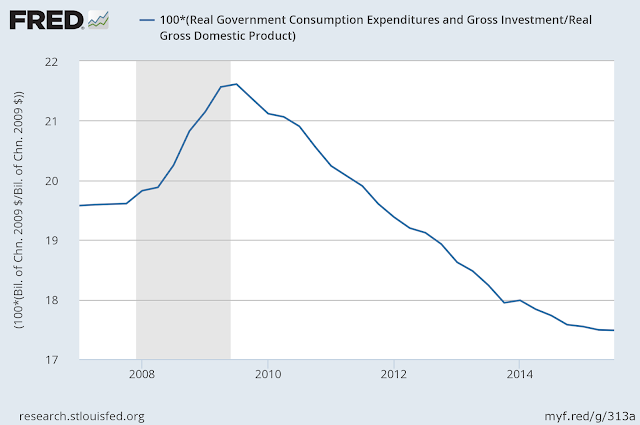 But, if fiscal multipliers are actually large, then given the large decline in government spending since the recession, we might have expected that the performance of private demand would be far worse. And I don't think we would expect to see unemployment in the 5 percent range, as it currently is. So, that gives us a big effect. 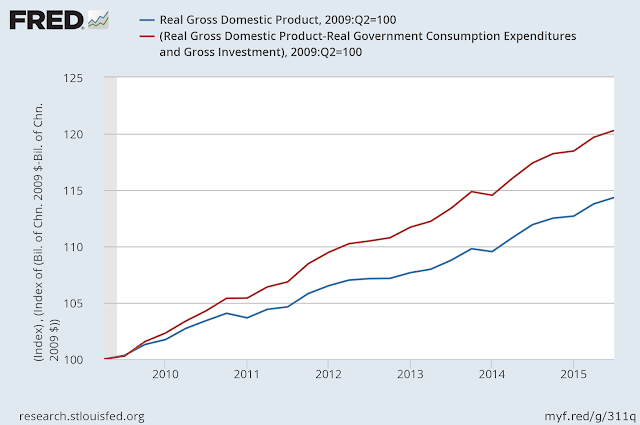 Given these assumptions, real GDP would have grown at an average rate of about 4.1% instead of 2.2%, with real GDP 13.3% higher than it actually was in the third quarter of 2015. So 67.2% is much higher than 59.3%, which is the current epop ratio, and is also higher than epop at the previous peak (63.4% in December 2006) or the all-time high of 64.7% in April 2000. 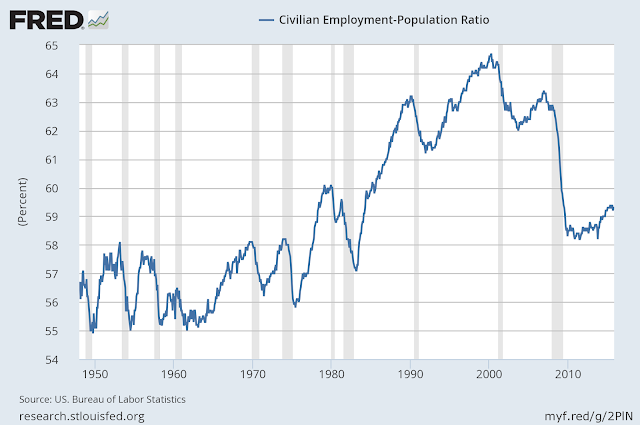 Recall that epop has fallen since before the recession in line with a decline in the labor force participation rate. A substantial part of that decline was due to an aging in the population, but also to a decline in labor force participation in the young and prime-age groups. So, given our current demographics, and assuming no difference in average labor productivity, to produce the quantity of output consistent with a multiplier of 2, and what I think Krugman would consider mild stimulus (3% growth per year in government spending), each age group would have to be working much harder than they are now, and harder than any of their predecessors did. 1. When Keynesians say "inadequate demand" they really mean than prices and wages are screwed up. How does wage and price stickiness persist for more than seven years after the beginning of the Great Recession? How does a Summers secular stagnation sticky-wage-and-price phenomenon persist indefinitely? How do we square these ideas with what we know about the frequency and size of price and wage changes? 2. As I pointed out in this post and this one, the labor market in the U.S. is actually quite tight. There's no "slack" there, in Krugman's sense. 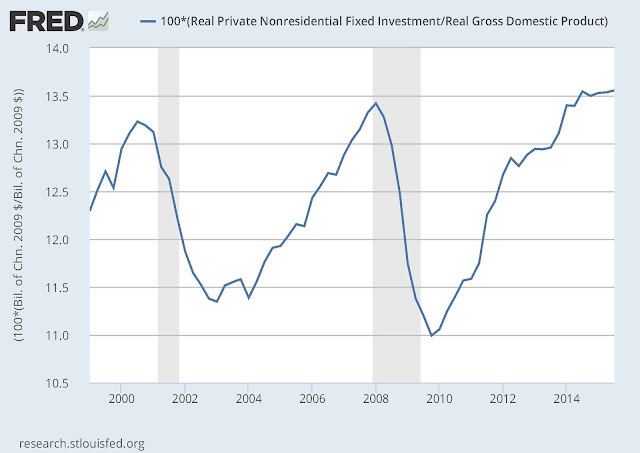 So, if anything, investment rates are high. To address why real interest rates are low, it's likely more productive to think about how asset markets work - for example to explore issues related to safe asset shortages. What to conclude? Taylor should not take Krugman's jabs too seriously. We should be thinking about long-run issues. ...secular stagnation is the hypothesis that the IS curve has shifted back and down so that the real interest rate consistent with full employment has declined. ...broad technological features of the economy have changed that should not have been expected to be constant. That there are a variety of trends that are evolving that have led to lower real rates with the right presumption being that that will continue to be the case for quite some time to come. What exactly are these "broad technological features" that changed? Apparently we should have expected them to change, whatever they are. What is the "variety of trends" and how are they evolving? Suffice to say that the broad technological features have changed in a persistent way, and along with the variety of evolving trends will cause low real rates of interest to continue to be low indefinitely. If you're enlightened by this, you'll have to explain it to me. Now, on to Summers's policy critique. He has four complaints. First, the Fed assigns a much greater chance that we will reach 2 per cent core inflation than is suggested by most available data. Inflation swaps suggest inflation on the Fed’s preferred PCE deflator measure will average only 1 per cent over the next 3 years, 1.2 per cent over the next 5 years and 1.5 per cent over the next 10 years. Survey measures of expected inflation are falling not rising. Moreover, if account is taken of quality change inflation measures would have to be further reduced. There are many ways to measure anticipated inflation. We can use inflation swaps data, as Summers does; we can look at the breakeven rates implied by the yields on nominal Treasury securities and TIPS; and we can look at survey measures. What do people who do forecasting for a living, and who have access to all of that data, say? The Philly Fed's most recent Survey of Professional Forecasters has predictions of PCE headline inflation for 2016 and 2017, respectively, of 1.8% and 1.9%, which is pretty close to the 2% PCE inflation target. A Wall Street Journal survey shows a CPI inflation forecast that seems roughly consistent with the December FOMC projections for PCE inflation. So, it seems that "most available data," filtered through the minds and models of professional forecasters, suggests no less optimism than the FOMC is expressing in its projections, about achieving 2% inflation in the future. 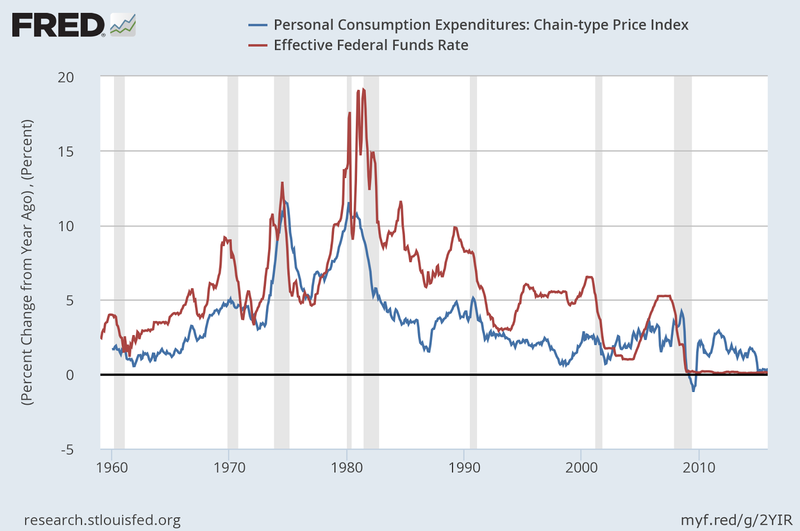 Second, the Fed seems to mistakenly regard 2 per cent inflation as a ceiling not a target. One can reasonably argue that after years of below target inflation, it is appropriate to have a period of above target inflation. This is implied by arguments for price level targeting. Alternatively, it seems reasonable to simply suggest that the Fed should run equal risks of over and under shooting its inflation target. I would actually argue given the observed costs of deflation that the costs of under shooting the target exceed the costs of overshooting it. In setting monetary policy, the Committee seeks to mitigate deviations of inflation from its longer-run goal and deviations of employment from the Committee’s assessments of its maximum level. So, deviations of inflation from 2%, on both the high and low sides, are considered by the FOMC to be undesirable. Why does it look to Summers as if 2% is a ceiling? He doesn't give us much to go on. 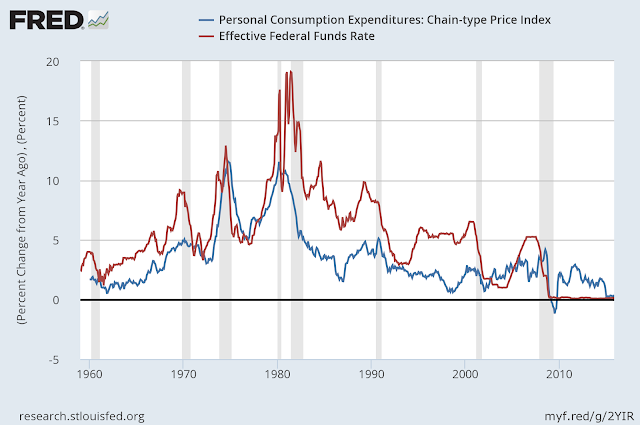 Third, the Fed seems to be in the thrall of notions that might be right but do not to my knowledge have analytic support premised on the idea that the rate of change of interest rates as distinct from their level influences aggregate demand. It is suggested that by raising rates the Fed gives itself room to lower them. This is tautologically true but I know of no model in which demand will be stronger in say 2018 if rates rise and then fall than if they are kept constant at zero. Nor conditional on their reaching say 3 per cent at the end of 2017 do I know of a reason why recession is more likely if the changes are backloaded. I would say the argument that the Fed should raise rates so as to have room to lower them is in the category with the argument that I should starve myself in order to have the pleasure of relieving my hunger pangs. Here, i is the nominal interest rate, Greek pi is the inflation rate, and x is the output gap. 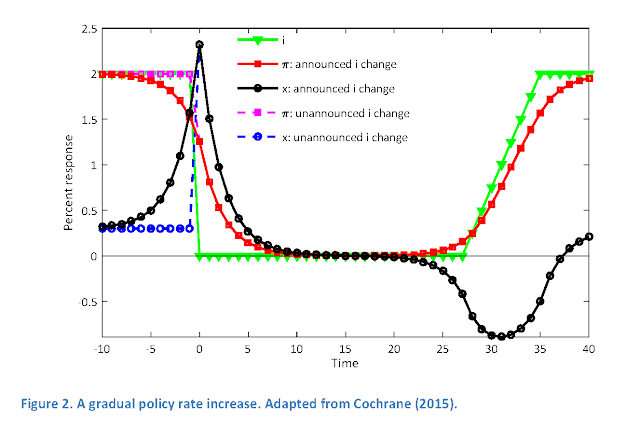 The figure shows the results of a reduction in the nominal interest rate to zero, followed, after a period of time, by a gradual increase in the nominal interest rate so as to achieve the inflation target. You can see that the sharp drop to zero in the nominal rate also gives a sharp - but temporary - increase in output. With a gradual increase in nominal interest rates, the corresponding drop in output is smaller, but persists for a longer time. So, if the nominal interest rate stayed at zero instead of increasing, then the output gap would stay at zero. But, suppose that we do Summers's "2018" experiment, i.e. return to zero somewhere in the right-hand side of the figure. Then the output gap will indeed be positive for a period of time. So, Summers is incorrect. Indeed, I think it would be difficult to find a model with a non-neutrality of money where this is not the case. Typically, a change in the nominal interest rate produces a short-run nonneutrality. That is, there are temporary real effects, and if the nominal interest rate persists at this different level, the real effects disappear. Fundamentally, it is true that the central bank can't go down unless it goes up. Whatever the benefits of stabilization by way of monetary policy are, the central bank cannot exploit them unless it sometimes chooses to have market nominal interest rates go up. Fourth, the Fed is likely underestimating secular stagnation. It is failing to recognise its transmission from the rest of the world and it is overestimating the degree of monetary accommodation now present and likely to be present in the future by overestimating the neutral rate. I suspect that if nominal interest rates were 3 per cent and inflation were far below target there would be much less pressure to raise them than there has been of late. The desire to raise rates reflects less some rigorous Philips curve analysis than a sense that zero rates are a sign of pathology and an economy creating 200,000 jobs a month is not diseased. The complexity is that zero rates may be less abnormal than is supposed because of fundamental shifts in the saving investment balance. 1. "...the Fed is likely underestimating secular stagnation." Since Summers has not defined the concept clearly, it's hard to see how anyone could pay too little attention to it. But economists - both inside the Fed and outside - certainly are not ignoring the phenomenon of low real interest rates and the implications. Far from it. If we take "inflation far below target" to mean zero or lower, say, then a 3% fed funds rate and and inflation far below target has never occurred in the time series since 1960. If it did occur, then I think people would be scratching their heads about it. Would the Fed be talking about raising rates? Who knows? Seems like asking what you would do if you came around a bend in the road and encountered a two-headed goat. 3. "The desire to raise rates reflects less some rigorous Philips curve analysis than a sense that zero rates are a sign of pathology and an economy creating 200,000 jobs a month is not diseased." First, I'm not a big fan of using "rigorous" and "Phillips curve" in the same sentence. Second, it is true that a standard argument for liftoff is that that the current level of the policy rate is not consistent with: (i) past Fed behavior and (ii) the proximity of inflation and unemployment to the Fed's goals. So, to justify continued zero interest rate policy, one would have to make a case that there is something wrong with the way policy was conducted in the past, or something different about current circumstances. Summers might say that the different circumstance is secular stagnation. If so, he needs to be more explicit about what this is about. The FOMC's "Policy Normalization Principles and Plans" entered the execution stage last week, as of course you know. The first stage in normalization was liftoff - the departure of the fed funds target range from 0-0.25%, where it had been for the last seven years. As I outlined in this St. Louis Fed Review piece, actual monetary policy implementation over the foreseeable future will be anything but normal, due to some quirks in the U.S. financial system and our large central bank balance sheet. A typical central bank formulates policy in the very short run by choosing a target for some short-term (usually overnight) nominal interest rate. The procedure for hitting that target depends on the nature of financial markets, and the structure of the banking sytem, among other things. One approach is to operate a channel or corridor system, under which the central bank lends to financial institutions at x%, offers financial institutions deposits (reserves) at the central bank at y%, with a target overnight interest rate of z%. The channel is structured with x >= z >= y, and arbitrage prevents the overnight rate from escaping the channel. A good example of a channel system in operation is Canada, where x - z = z - y = 25 basis points. In the Canadian banking system there are no reserve requirements, and the financial system operates essentially with zero reserves (with a little slippage) overnight while the corridor system is in operation. The U.S. system before the financial crisis was a type of channel system with the interest rate on reserves at zero, the Fed's discount rate determining the upper bound on the overnight rate, and the fed funds rate serving as the target interest rate. If there are sufficient reserves outstanding (and sufficient need not be much - see my Review article on what happened in Canada, 2010-2011), then a channel system becomes a floor system. That is, in the example, arbitrage should dictate that the overnight rate is y%. But, in the U.S. financial system, arbitrage is imperfect - there are frictions. First, government sponsored enterprises (GSEs) cannot receive interest on their reserve accounts with the Fed, by law. Second, the financial institutions that do receive interest on reserves - depository institutions - face regulatory costs to holding reserves, which is where the friction comes in. So, the Fed has another instrument - overnight reverse repurchase agreements (or ON-RRPs) - which helps it to hit its target for the overnight fed funds rate. An ON-RRP is an overnight loan to the Fed, so think of this as just another interest-bearing Fed liability, like reserves. There is an expanded list of counterparties who can engage in ON-RRPs with the Fed, and that list includes GSEs and money market mutual funds - the first set of institutions cannot receive interest on reserves, and the second do not have reserve accounts. 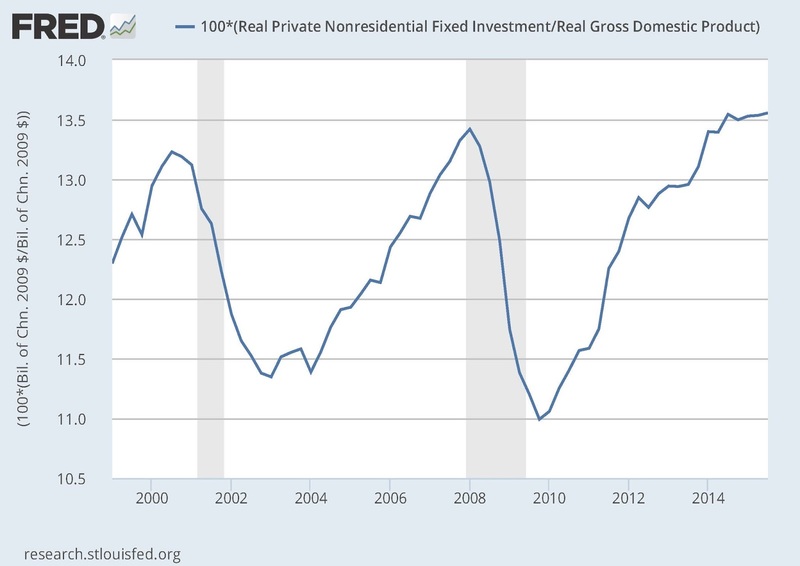 So, the Fed's ON-RRP facility extends the reach of interest-bearing Fed liabilities. ...the Committee decided to raise the target range for the federal funds rate to 1/4 to 1/2 percent. Information on the details of the directive that the Open Market Desk at the New York Fed received is in this implementation note. Basically, the idea is that the only operations that are necessary for the New York Fed for the immediate future are daily ON-RRP operations. These will be conducted at a rate of 0.25%, with no constraints other than available collateral - the securities on the Fed's balance sheet that are not otherwise accounted for - and per-counterparty limits of $30 billion. Actual ON-RRP transactions are reported on the New York Fed's website. After the change in policy, the takeup on the ON-RRP facility on Thursday, Friday, and Monday, was, respectively, $105 billion, $143 billion, and $160 billion. So, the quantity of outstanding ON-RRPs has been increasing, but is very modest relative to reserves (at $2.5 trillion) or the quantity of available collateral, which is about $2 trillion. But did the New York Fed actually succeed in controlling the fed funds rate within the specified range of 0.25-0.50%? You can see the results here. On the first three days after liftoff, the effective fed funds rate (an average of rates in individual trades on the market) was 0.37%, 0.37%, and 0.36%, respectively, which is, perhaps surprisingly, in the middle of the range. The dispersion in fed funds rates is small (the standard deviation is 0.05), but there are trades on the fed funds market as high as 0.59% (above the IOER), and as low as 0.25% (the ON-RRP rate). There can be dispersion in fed funds rates because of idiosyncratic counterparty risk in the market (fed funds is unsecured credit) - this was an important factor during the financial crisis for example. But, under current conditions, any dispersion in rates is in part due to the heterogeneous nature of trading. In particular, there are basically two kinds of borrowers in the market. The first is a depository institution which receives interest on reserves, and is borrowing from some financial institution - typically a GSE - that does not want to be caught holding reserves overnight that earn zero interest. These trades typically occur at an interest rate less than the IOER. The second is a depository institution which, much as in pre-financial crisis times, finds itself short of reserves at the end of the day, and borrows on the fed funds market to replenish reserves. Due to the huge stock of reserves currently in the system, there are very few of these depository institutions at the end of each day, and therefore very few of these transactions. Seemingly, these are the trades that occur above IOER, because the lenders face different opportunity costs than in cases where the lenders cannot receive interest on reserves. So, balance sheet reduction, when it happens, will result when the the Fed's assets are maturing, and they are not being replaced. No outright sales, other than for fine-tuning purposes, are anticipated. A normal balance sheet will have: (i) a small quantity of reserves, on the order of what was outstanding prior to the financial crisis; (ii) a portfolio consisting of only Treasury securities (no mortgage backed securities, for example); (iii) an asset portfolio with a shorter average maturity than currently, again comparable to what existed before the financial crisis. According to this paper by Carpenter et al., normalization in the size of the balance sheet might take 6 years or more from the time reinvestment ends, and normalization in terms of average maturity of the asset portfolio will take even longer. As normalization proceeds, an issue will arise as to how balance sheet reduction relates to increases in the fed funds rate range. Clearly, the large-scale asset purchases that occurred were viewed by some policymakers as being equivalent to reductions in the fed funds rate target. One view is that we can translate a quantity of nominal asset purchases by the Fed into a given basis point decrease in the fed funds rate, were such a decrease feasible. A second view is that the size of the balance sheet is immaterial - what matters is the composition of the Fed's asset holdings, for example as measured by average maturity. A third view is that neither the size of the balance sheet nor its composition makes any difference - quantitative easing is neutral, and only the short-term nominal interest rate matters. Which view one takes clearly matters a great deal for how normalization should proceed. I wanted to think about some of these issues, and understand more about how the Fed's ON-RRP facility works, so I wrote this paper. This is a model with two banking sectors - basically regulated and unregulated. In the regulated sector, banks can hold interest-bearing reserves, and they have a capital requirement. 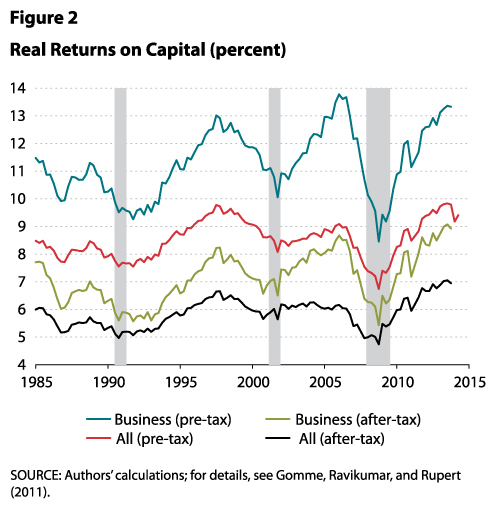 Unregulated banks cannot hold reserves, but they also don't have capital requirements. There are four assets: currency, reserves, government debt (one period nominal bonds), and private assets. Regulated and unregulated banks serve different clienteles. The regulated banks offer deposit contracts that provide for currency withdrawal on demand and transactions services (looks like the opportunity to do debit card transactions), and the unregulated banks provide intermediation services that can be interpreted as involving repurchase agreements (repos) using government debt as collateral. In the model, currency and government debt have special roles: currency is the only asset accepted in some transactions, and government debt is the only collateral acceptable in some types of credit transactions. There is an interbank credit market on which regulated and unregulated banks can trade. In the model, if the balance sheet of the central bank gets large enough, then there can be a positive margin between the interest rate on reserves and the interbank interest rate. As well, there can be a positive margin between the interbank rate and the interest rate on government debt, provided government debt is in sufficiently low supply, in a well-defined sense. This corresponds to what we have been observing recently. In particular, in the last few days short-term T-bills have been trading not only below the interest rate on reserves and the fed funds rate, but below the ON-RRP rate. Basically, the interest rate on government debt in the model can be lower than the interbank rate due to a higher liquidity premium on government debt. I introduce an ON-RRP facility in the model (basically the unregulated banks can hold interest-bearing central bank liabilities). This does what it is supposed to do - it puts a floor under the interbank rate. As well, more ON-RRPs are always welfare improving. Further, a large central bank balance sheet is a bad thing. Reserves in the model are assets that sit on the balance sheets of regulated banks, and are costly to hold because of the capital requirement. That is, because of the capital requirement, a swap of reserves for government debt tightens collateral constraints and can make everyone worse off. As well, the expanded balance sheet converts assets that are useful in particular transactions as collateral (government debt) into reserves, which are not useful in that sense. In terms of "tightening" by way of an increase in the interest rate on reserves vs. a reduction in the balance sheet, these two policy changes have similar effects on market interest rates. However, the effects on quantities and on welfare are very different. I think these results are interesting. Let me know what you think.